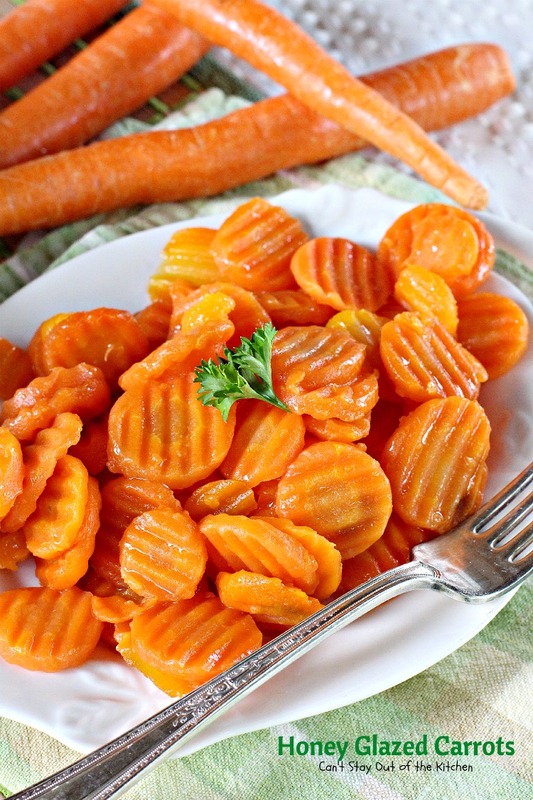 Honey Glazed Carrots are absolutely delightful. Carrots are one of my favorite vegetables. 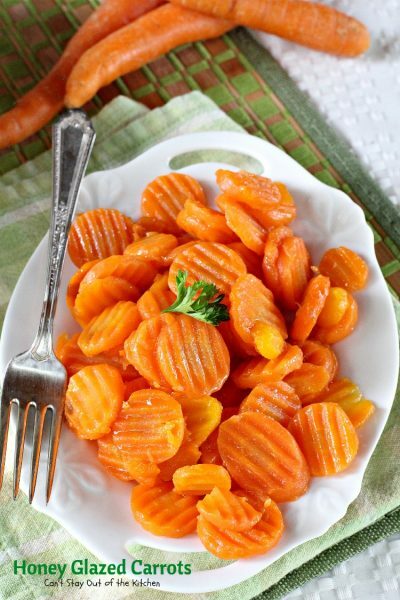 Using crinkle-cut or baby carrots in recipes provide so much texture and crunch for soups, casseroles, or salads. Not to mention carrots are high in beta-carotene and other antioxidants that are so good for your health. Normally, this recipe is cooked on the stove top, but because I wanted to have them ready when I got home from church yesterday, I decided to try making this great recipe in the oven so I could cook it along with my King Ranch Chicken casserole. I suppose I could have pre-made the Honey Glazed Carrots and heated them up quickly in the microwave or on the stove when I got home, but it sure was nice having these already ready to go. They turned out just as tasty as if I had made them on the stove top, too. Honey Glazed Carrots is an incredibly easy and delicious dish you can prepare in a snap. 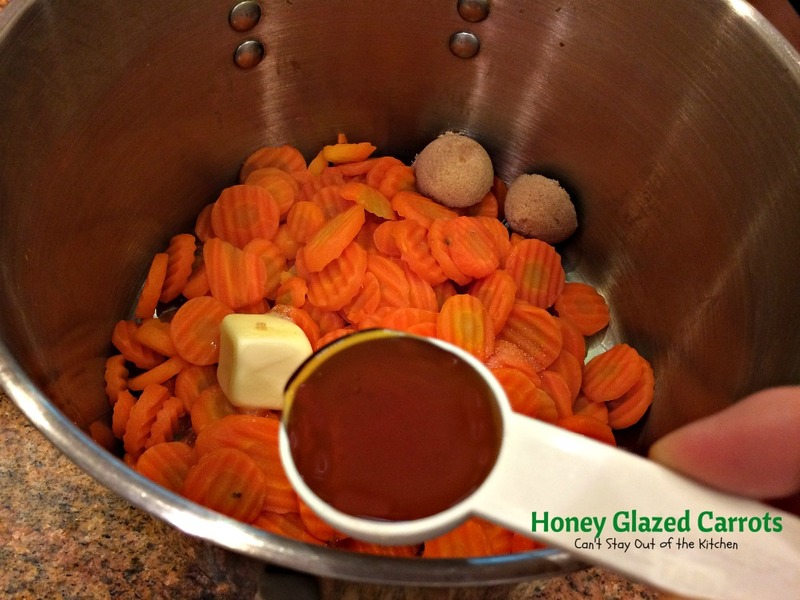 The sweet flavors of honey and brown sugar glaze the carrots and provide such a tasty flavor. This recipe is kid friendly, too. 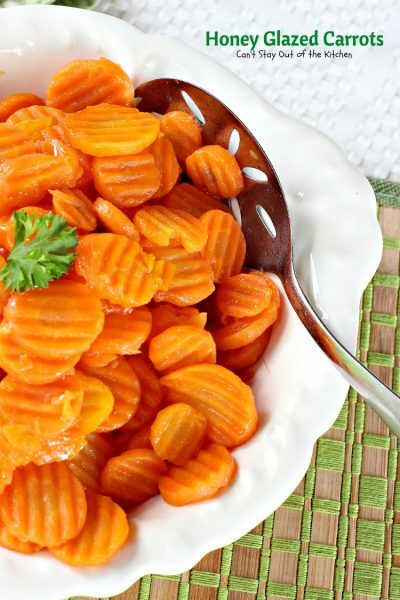 Many kids will learn to enjoy carrots after trying this sweet recipe. I found this recipe years ago shortly after we married in the Pillsbury Cookbook, 1972 edition. 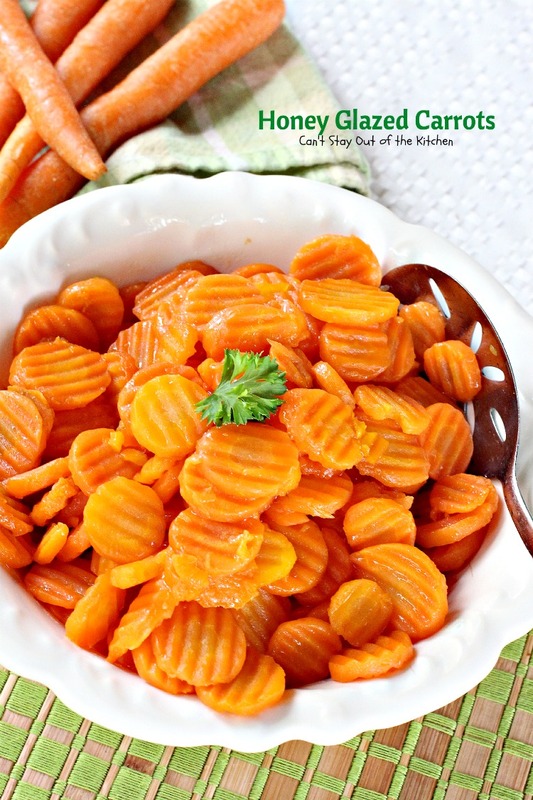 It has only 5 ingredients and is a wonderful way to serve carrots. 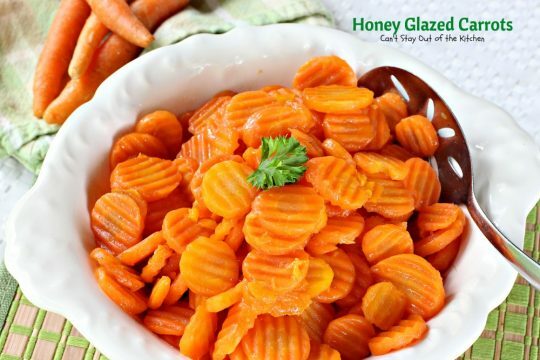 If you need a quick way to throw together a side dish for dinner, a special meal, or even as a holiday dish, consider giving this Honey Glazed Carrots recipe a try. You won’t be disappointed. We love this quick and easy recipe, and we believe you will too. When I initially posted this recipe in February 2013, I was still using an iPhone for a camera, so the pictures were not the greatest. I also baked the recipe rather than making it on top of the stove, which is what I usually do. I remade this recipe (stove-top method) for a family in our Sunday school class who recently underwent bereavement (April 2015). Because this recipe is gluten free, it was a perfect accompaniment to the all the gluten free food I provided (because she has Celiac’s Disease). If you need the recipe to be vegan, simply substitute coconut oil for the butter in the recipe. We’ve always enjoyed this side dish and it’s great for holiday fare, too. Honey Glazed Carrots is a fantastic dish to prepare for holiday menus. These sweet carrots are a great way to get your kids to eat their carrots! This 5-ingredient recipe is fantastic. So quick and easy. Bring carrots to a boil in a large stockpot. Cook until tender – 15-20 minutes. Drain. Add butter, salt, brown sugar and honey. Here I’ve served the carrots. You will need to stir well before dishing out each serving to make sure the carrots get plenty of the butter/brown sugar/honey mixture. We’ve made this recipe so many times throughout the years, and it always pleases. It’s gluten free, too. 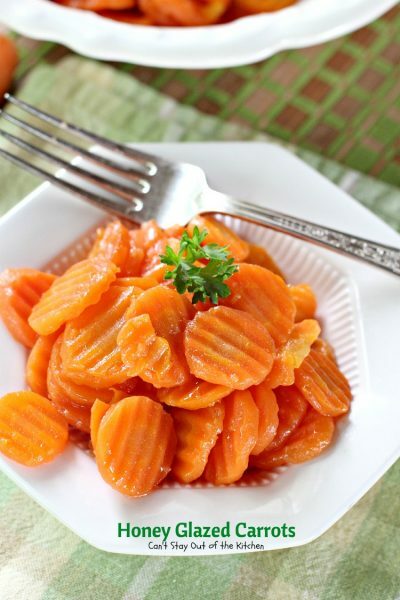 Scrumptious carrot recipe is great for holiday menus, but so quick and easy you can serve it anytime. In stockpot, cook carrots in boiling water until fork tender. Drain. Pour carrots back into stockpot. Add remaining ingredients; heat in saucepan for 5-10 minutes to glaze well. Remove to serving bowl to serve. NOTE: This recipe can be baked or cooked on the stove top. To bake: Place carrots in a greased casserole dish. Add pats of butter on top of the carrots. Then sprinkle with brown sugar and honey. Bake covered about 45 minutes at 350 or until carrots are fork tender. Stir well to glaze all of the veggies with the sauce. NOTE: You can also microwave the carrots according to package directions—16-oz. bag frozen sliced or baby carrots. Recipe adapted from Pillsbury cookbook, circa 1972. This recipe can be baked or cooked on the stove top. 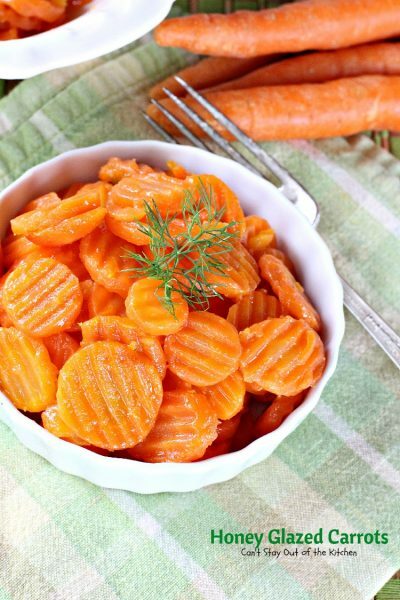 To bake: Place carrots in a greased casserole dish. Add pats of butter on top of the carrots. Then sprinkle with brown sugar and honey. Bake covered about 45 minutes at 350 or until carrots are fork tender. Stir well to glaze all of the veggies with the sauce. [br][br]You can also microwave the carrots according to package directions—16-oz. bag frozen sliced or baby carrots. 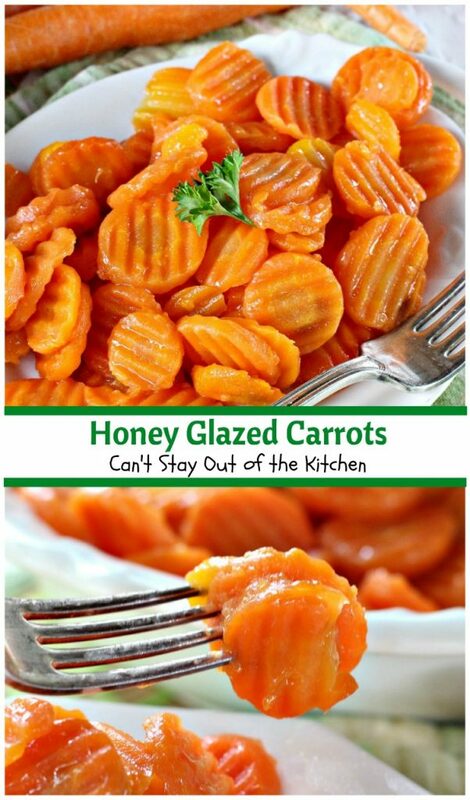 These Honey Glazed Carrots are so easy to make. They make a terrific side dish and they’re a great way to use up carrots. 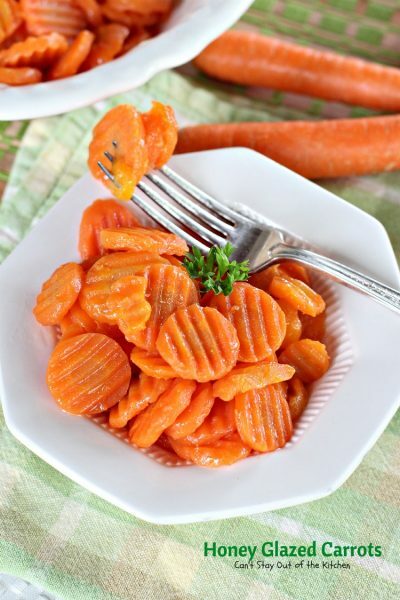 Each bite of Honey Glazed Carrots is amazing! Thanks for the link love. 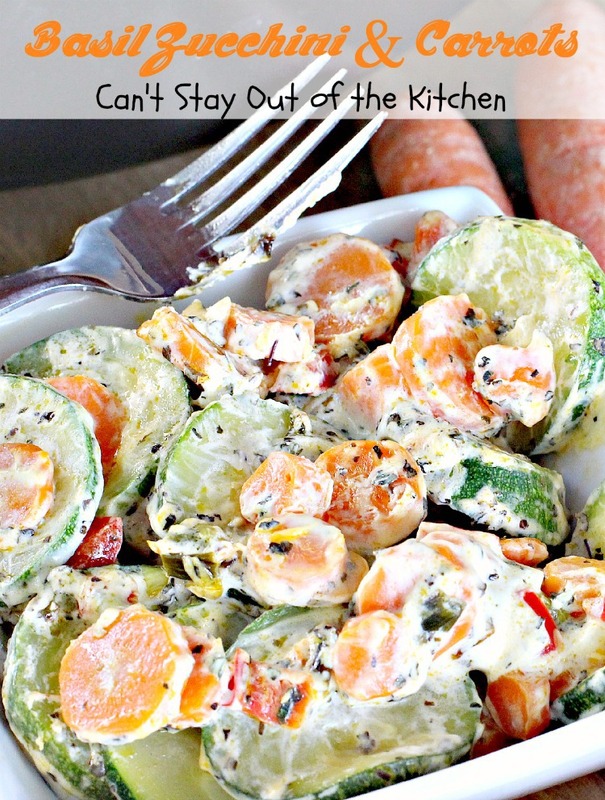 Carrots are so yummy and it’s awesome to find more ways to use them than just raw. Sweetening them up really helps more of them to be eaten in my house, along with roasting them in olive oil with salt and fresh cracked black pepper. You’re welcome. Hope you enjoy them. I think I’ll try roasting them with olive oil and salt and pepper some time. Sounds wonderful! I love the sound of honey glazed carrots! We normally ate ours raw or lightly sautéed, but never baked in the oven. And never with a glaze… But that sweet honey would have gotten me to eat my veggies a lot more as a kid! They’re delicious and you can cook them on top of the stove if that’s easier for you. Try adding some dill next time to this recipe. It is really good. I used to make these all the time.